Families served by the funeral directors of Strang Funeral Chapel & Crematorium take great comfort in knowing that we have their best interest in mind. We never forget that completing all the necessary arrangements of a funeral service is a task most families face only a few times in their lifetime. All funeral directors at Strang Funeral Chapel are knowledgeable in the special funeral traditions of all faiths and ethnic backgrounds. They can assist you in completing all of the arrangements within your financial means and with the special preferences you desire. Our intention is to help make each and every ceremony personal and meaningful and truly reflective of the life that was lived. A funeral service can range from a traditional funeral service to a memorial service to a private service. For some it is a religious ceremony based in tradition handed down through generations of family. Some prefer to have a gathering of friends to informally provide reflections and stories of what that person meant to them. Our goal is to listen to your wishes and assemble a service that will honor your loved one. With each funeral service, we honor those who have passed, and celebrate the life that was lived. Strang Funeral Chapel has continued to meet the needs of the Lake County community for over 112 years. George E Strang opened Strang Furniture and Undertaking in Grayslake in 1898. He provided the local community with thoughtful and caring funeral services in private homes and churches. 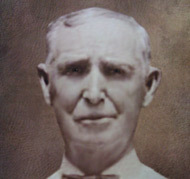 George Strang had two sons that followed him into the funeral industry. 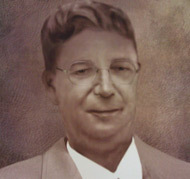 Leland G Strang moved north to Antioch and began his own funeral business, while Harold J Strang received his funeral director’s license in 1926 and operated Strang Funeral Chapel in downtown Grayslake for 34 years. Harold had 3 children. His son David grew up to carry on the family business. 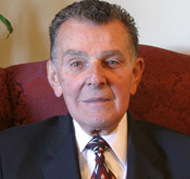 After serving four years in the United States Army as a World War II Paratrooper, David returned and went on to attend Worsham College in Chicago for mortuary studies. In 1953, he was licensed as a funeral director and embalmer and became the third generation of funeral directors in his family. In 1954, David Strang designed a state-of-the-art facility at 410 E Belvidere Road in Grayslake. Over the years, the funeral home has expanded to meet the growing needs of the community, but remains at the same location. To meet the growing community’s needs, Strang Funeral Chapel purchased a crematorium in 1996 and is staffed solely with Strang Funeral Chapel associates to ensure the highest degree of quality and care. In 1999, a second large chapel was created to meet the needs of the growing population. This area also allows families to provide refreshments to their guests. Sadly David passed away on September 7, 2015 at the age of 85. Although he has passed, his legacy will continue to live on, as the funeral home and staff strive to keep the funeral home and quality of service just as Dave would want it.